HAPPY 4TH OF JULY! A day when we celebrate our nation’s independence. It occurs to me that a relatively small group of men, with passion and commitment for their cause, ultimately convinced a nation to follow their lead. How impressive is that! And how similar to us (The Academy of Applique) a relatively small group of women with passion and commitment for our cause; that of practicing and spreading the love of appliqué. Ever since my boys were little, I was known as “The Quilt Lady.” I think I have worked with more classrooms (in school and church) sharing my passion of quilting, than fireworks celebrating the 4th. Sharing the history of this art form, and watching the pride in the students upon their completion of a “handmade” project; gave me hope for the future of this generation. I LOVED working with the kids (and now have a greater respect for actual teachers). Kids from the “immediate gratification” and “the world owes me” generation, opened their minds, if only for a bit, to the values of a previous generation. How wonderful! Do you have a similar past? And then, at some point, I found appliqué. This offered another layer of the art form for me. It is ANYTHING but “immediate gratification,” but I love the hand work. I love feeling that I am creative (although I use commercial patterns), I love the process, and I love the feeling of pride upon completion. I talk constantly about what project I just finished, what project I am going to start, and what project I would ultimately like to accomplish. I talk about teachers, designers, and hero appliqué’rs. Those that know me, at work or at play, know that I am an Appliquér. Do you share the same credentials and your passion for this art form? To keep this passion, commitment, and art form alive . . .and in honor of the 4th of July . . . the Academy of Appliqué offers this “SPECIAL:” Invite, coerce, drag a new attendee to the Academy of Appliqué in historic Williamsburg in 2016 and receive $50.00 off of both your and the new attendee’s tuition. I am convinced that once they experience the Academy, and see your works as well as those of our nationally known teachers . . . they will be hooked. The goal is to increase the number of followers to our cause and art form – appliqué. This can be ANYONE that did not attend the Academy this year (2015). The offer is valid for main academy classes, or Add-A-Day classes. The offer can be “stacked” – if you invite two new attendees you will receive $100.00 off of your tuition, and each of the new attendees will receive a tuition reduction of $50.00 each. Help spread the word! And again, Happy 4th of July! HAPPY EASTER! What a beautiful day it was here in Williamsburg, VA. The sun was shining, the birds were singing – Spring is in the air. For me, almost the best part of the day was that the Hallmark channel ran the “Love series” movies by Janette Oake ALL DAY! What a great day to stitch, and stitch I did. I decided to put Sarah’s Revival aside for a bit as I am having trouble with the corner blocks of the outside border and thought the best thing was to walk away so no one got hurt (Ha Ha). I stitched this mini Dresden plate since the Academy, for my soon to be fourth grandchild – Elias Gerl – due any minute. I think I will scallop the outside border after it is machine quilted, and bind it in blue. 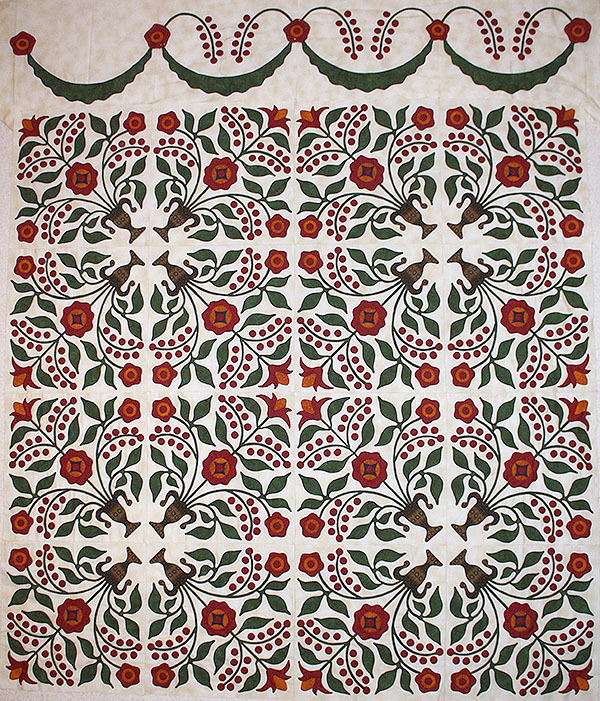 Then I went back to my Lily Rosenberry Quilt (yet another Sue Garman quilt. Do you see a pattern? 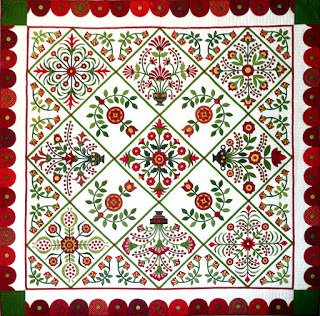 I LOVE her quilts) and am having a ball with the 1200 (or so) berries. I am stitching this one in red and greens, but can’t wait to finish and stitch another in Sue’s brown, pinks, and Kelly greens. It is BEAUTIFUL! Check out her website, if you haven’t had a chance www.comequilt.com. I wonder if she would share what brown she used. Keep watching your emails and the website, as we will post a “SPECIAL” soon for those that bring either a new Appliquer and/or an attendee new to the Academy. And remember, I am always available if you have questions, comments, or just want to chat Barbara@Academyofapplique.com or (757) 565-5299. 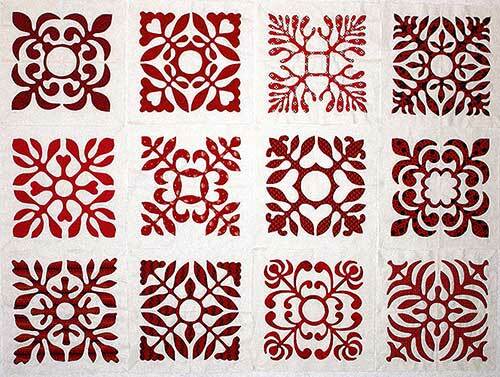 By Barbara|Academy Business, Quilts|Be the first to comment! How has your summer been going? Mine has been wonderful . . . and busy. 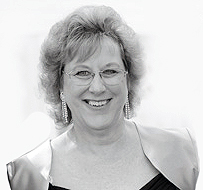 The Academy of Applique has been such a fun and rewarding journey. I finally have the opportunity to combine by business acumen learned over MANY long years as a Finance Director, and my “hobby/obsession” quilting, and specifically, applique. Everyone has been SOOO supportive – there are not words to express my thanks to everyone. Friends and Attendees have helped me distribute literally tens of thousands of marketing postcards. The reception has been terrific. It is fun to watch marketing cards be sent or delivered to a specific area of the country, and within days, multiple sign ups on the website from that area. How exciting. The teachers, too, have been most gracious and sharing of their experiences, thoughts, and time. They truly are an amazing group. I want to send a special THANK YOU to Nancy Kerns and Teresa Jones for helping me through this first year, and letting me bounce ideas off them. You girls ROCK! 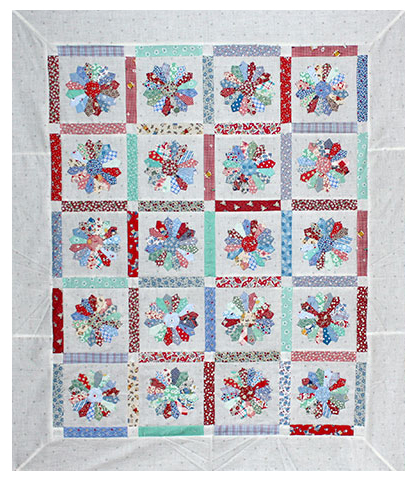 By Barbara|Quilts|Be the first to comment! How was your 4th of July weekend? I was fortunate enough to have my 86 year old mother, and sister visit from California. My mother ( a late blooming quilter – she only started about 20 years ago) and I spent numerous hours discussing quilt patterns and quilting in a frame – which I LOVE doing. It was perfect weather here in Williamsburg, as the hurricane missed us but offered a cool breeze and moderate temperatures. I had ample time to appliqué. 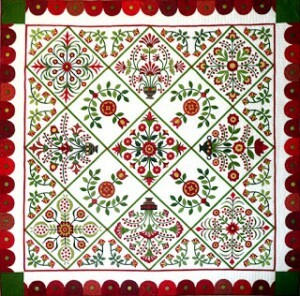 Having finished Sue Garman’s “Bed of Roses,” I am currently working on Sue’s “Sarah’s Revival.” It is approximately (36) paper cut blocks in red and green that are just too fun to stitch. Even with working full time, I can “crank” out 2 – 3 a week. What a sense of accomplishment to see them on the design wall. This is coming together VERY quickly. I am currently in the process of mailing out over 13,000 marketing cards to about 500 quilt stores on the Eastern seaboard. What is your favorite store? I will gladly check to make sure they received this material. Do you belong to a guild? If you can email me a contact, I would greatly appreciate the opportunity to send them an ad to be included in your next newsletter. Let’s continue spreading the word! I thought I would write a bit on what to expect when registering for the Academy. First, some important dates: August 9th, 2014 the website will be updated to show the Class Schedule for the 2015 Academy. Class/project pictures, descriptions of techniques taught, supply lists and registration fees will be available on that date. Historically, this has always been an exciting time for me as I read, re-read, and re-re-read the schedule trying to decide which classes I would register for. Then came the emails and phone calls to friends again discussing which classes we would take together, so as to spend more quality bonding time. Some friends I, unfortunately, only get to see once a year at the Academy. Room reservations will be made individually. Don’t forget to mention “The Academy of Appliqué” to receive the discounted room rate. The next important date is Tuesday, September 3, 2014 when registration will open. Registration will be performed on-line and payments will be made thru PayPal. Some have asked what to do if they do not use credit cards. Paypal is a very easy process to set up and can withdraw the agreed amount directly from your checking or savings account.